Tonight I parked at the end of San Antonio Road (Terminal Blvd.) and finished the remaining half-mile I pooped out on yesterday (due to a poor choice of footwear (flip flops) for a 6-mile walk). Actually it was closer to a mile for the round-trip walk to and from the spot I stopped at yesterday (which was south of the animal shelter along Bayshore Rd.). 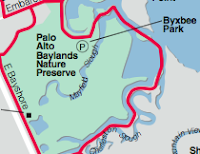 Wildlife sightings: No big gray fish were spotted where the creek (near the Highway 101 pedestrian/bicycle undercrossing) dumps into the bay this evening, as the water was already too dark to peer into and see anything clearly. Also, in the rush to get started, I forgot to change from flip flop sandals to walking shoes. Not advisable. Thank you to the folks at the restaurant who provided me with two bandaids; they lasted at least a mile on the trudge back before being rubbed off. Ultimately, I had to rest under a shade tree about a 1/2 mile from where the car was parked, and was picked up/rescued near San Antonio Road and Elwell Court. This location where I pooped out happened to be a stone's throw from my first job in Silicon Valley, as West Coast Editor of Telecommunications Magazine, giving me a chance to wax nostalgic for a few minutes. Also, nearby in a creek opening into the bay (at the bicycle/pedestrian underpass (under Highway 101)) were a group of large gray (what looked to be) carp fish. They were swimming around in murky, algae-green water surrounded by cement, mud, and cattails. Maybe the heat was affecting them too. 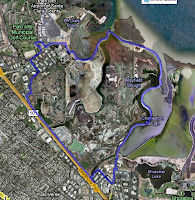 This evening I walked a short loop that covered one end of San Antonio Parking lot to the other end, and the beginning of the trail headed out toward the bay. It was getting dark so I had to head back before covering any significant distance. I will miss these longer days and summer evenings. I enjoyed a nice sunset, with rich warm colors reflected on the water and around a thick cluster of white pelicans and brown ducks. Today I walked from Shoreline Park's Lakeside Cafe/Boat House to the parking lot at the end of San Antonio Road/Terminal Blvd., passing along the lake and enjoying a slow parade of Canada geese, and a white egret wading in the water intently focused, I can only guess, on possible food items below the surface. Egrets have long, impossibly thin necks. It made me wonder what happens when they try to swallow something too large. There is always something else to learn about out here. 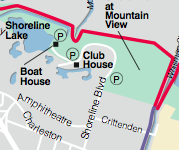 Walked with Toni from The Lakeside Cafe/Boat house at Shoreline Park to the Google Crittenden back parking lot. We didn't exactly follow the red line or trail pictured. Along the way, we climbed up a dirk peak, and experienced a very nice view of Moffett Field and the big white blimp (that takes people on an aerial tour of the bay for about $500); Shoreline Amphitheater and golf course; and other sites. We also discovered that without a detailed map, it is easy to get off on dead-end trails, or smaller trails that may not be marked. Thanks to Toni who suggested walking along the Steven's Creek Trail -- that starts in Mountain View, CA, and ends near Cupertino, CA. This walk launched the idea of hiking this trail (in segments), and, at the same time, got me started on walking around the Bay (following the contours of the water as closely as possible). After eating more than 1,000 chocolates (see http://www.chocolatebanquet.blogspot.com for more details), and living with the fall-out from our faltering economy in 2009, walking around San Francisco Bay (in segments) sounded like a fun, inexpensive way to get outdoors and shed a few pounds. The image shown above is from DreamWorks (2009) animated movie "Monsters vs. Aliens." I thought it captured an out-of-shape walker, hit by lay-off stress in the San Francisco Bay Area well (and with some humor). So here I go, charging off to walk around the bay.